I missed last month's Kids' Picks carnival at 5 Minutes for Books so I'm sort of getting back in the groove. It's no secret around here that we have a sea life obsessed three and a half year old running around these parts and so you shouldn't be at all surprised by the fact that his picks involve ocean life. 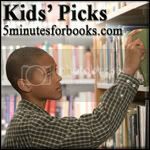 His first pick and a frequent requested read around these parts is My Visit to the Aquarium , by Aliki. I've written about Aliki before over at Reading My Library. She's a rather private author/illustrator and it's been hard to learn more about her, but just about everything that we've picked up by her we have absolutely loved. This book is no exception. In fact, it's greater than the general rule. 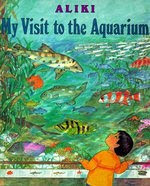 This book lays out a young child's visit to the aquarium, talking about how you can walk through coral reefs, touch things in a tide pool, see sharks being fed., etc. Actually, the book reminded me a great deal of aquarium in Long Beach, CA that we had the opportunity of visiting last year. My Visit to the Aquarium really sets up expectations well for a visit to the aquarium, whetting my young boy's appetite for real life visual encounters with octopuses, sharks and various and sundry sea life. I don't know if you could marry two subjects more perfectly for my son than to combine Thomas the Tank Engine and sea creatures. If your child has an interest in either, you should check out Down at the Docks which sits on our coffee table, very close by My Visit to the Aquarium . 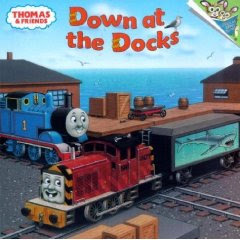 In this particular story, Thomas goes down to the docks to see if he can be of any use and he finds Salty toting around some aquarium cars which contain a dangerous looking shark (that scares the bejeebies out of Percy) and an octopus. Due to Percy having been frightened by the shark, a huge catastrophe occurs and the help of a brave and very useful little engine is required in order to clean up one huge mess! It's a cute story and it's about Thomas (oh, and an octopus!) and so we're happy with it. Bookworm1 was dancing jigs to be able to see a real octopus and he watched with fascination as the octopus ate his meal of a dungeness crab. His prayer at bedtime, following our return home, was full of thankfulness for the opportunity to see this beast hide under a rock and then come out and eat a crab. 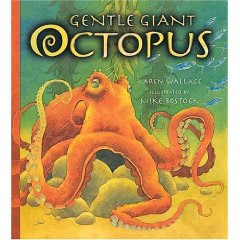 Gentle Giant Octopus tells the story of a mother octopus who is in search of a cave in which she can lay her eggs. She has a run in with a crab and an eel before she finds the perfect spot to place her babies. Did you know that an octopus can lay around 60,000 eggs at a time!? Any guesses as to how many survive?! I was blown away when I heard the answer. This book very nicely affirmed everything that the octopus feeder/tour guide told us when we were at the center which made this book the perfect follow-up for our trip. Haha! I love looking at it. I loved watching him decorate his cake too! He was just so very happy! We had a wonderful three day weekend together as a family. 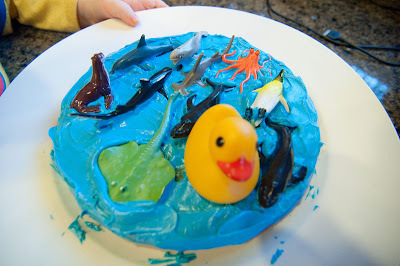 We're storing up the memories of our excitable and thankful child and learning so much about the ocean as we go! I love the cake!! What a good mommy you are! Love reading on a theme!! And the cake is awesome. Good job. That's a great cake. Very blue. Ah, my boys love Thomas. I'm kinda sick of it though. :( I know, I'm a fuddy dud! 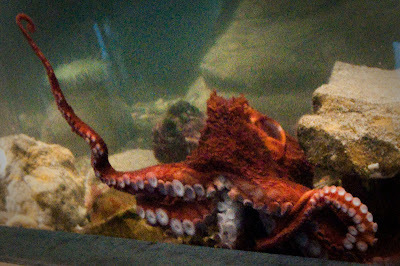 VERY cool that you got to watch an octopus being fed. I'm jealous!! What a fun day! I love his cake. I also think that Aliki's books are very good, and I never realized that there isn't much info about her out there. Now you have piqued my interest. Glad you had a great weekend. The cake is so cute! Great books. Thanks for the reviews.